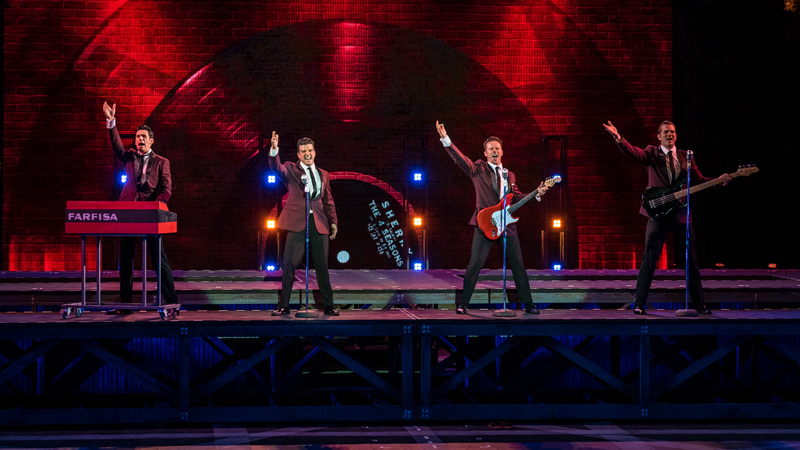 Unfortunately, due to the weather, we were unable to complete the Saturday, July 14th performance of Jersey Boys. 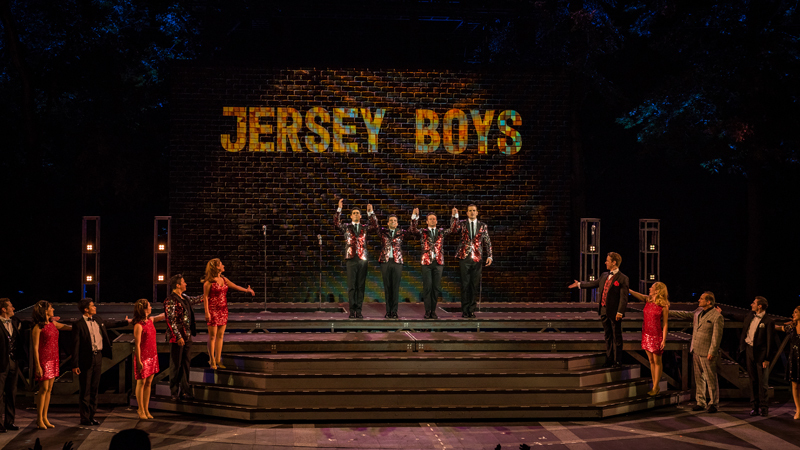 Anyone with a paid admission for Saturday night’s performance can exchange for another performance at The Muny Box Office starting Sunday, July 15th at 9 a.m. Refunds are also available at The Muny Box Office. made his Muny debut in 2013 as Enjolras in Les Misérables. Broadway: A Bronx Tale (directors Robert De Niro and Jerry Zaks). Other New York theatre: My Fair Lady (Bay Street Theater), Starting Here, Starting Now (York Theatre Company). Regional: all-male A Funny Thing Happened on the Way to the Forum (Two River Theater), Ken Ludwig’s A Comedy of Tenors (McCarter Theatre Center/Cleveland Play House, world premiere), Grease (Paper Mill Playhouse). Film/TV: If Beale Street Could Talk, Madam Secretary, The Code (pilot). Training: BFA, University of Michigan; Royal Academy of Dramatic Art. has been a performer for over 30 years. For the last seven years, he has been teaching English and music in Taiwan. Broadway: Fiddler on the Roof, Aida, Victor/Victoria starring Julie Andrews, Peter Hall’s The Merchant of Venice, Chess, Joseph and the Amazing Technicolor Dreamcoat, Roza and The First. Benari has also worked extensively in regional theatres and on national tours: Lend Me a Tenor (Tito Merelli), The Man of La Mancha (Don Quixote/Cervantes) and My Fair Lady (Henry Higgins). He has toured in Aida (Zoser), The Sound of Music (Captain Georg von Trapp) and Les Misérables (Thenardier). He also appeared with several symphonic orchestras (Los Angeles, San Francisco and Boston) as Boris Thomashefsky in Michael Tilson Thomas’s The Thomashefskys. Film/television: The Sopranos, Law & Order, And the Band Played On, Sea of Love with Al Pacino. directed Ken Ludwig’s Baskerville (Old Globe Theatre), Guys and Dolls (Asolo Rep and The Old Globe), Evita (Asolo Rep), Spamalot (5th Avenue Theatre), Ebenezer Scrooge’s Big Playhouse Christmas Show (Bucks County Playhouse) and Celestina Warbeck and the Banshees at The Wizarding World of Harry Potter. He also choreographed the Broadway productions of Rodgers + Hammerstein’s Cinderella, It Shoulda Been You, First Date and Bright Star. On London’s West End, he choreographed Carousel at the English National Opera and Sweeney Todd starring Emma Thompson. New York City Center Encores! : Zorba and Big River. Other credits include Company starring Neil Patrick Harris and Sondheim: The Birthday Concert (PBS), Broadway: Three Generations (Kennedy Center), Young Frankenstein (Muny). Rhodes is a proud graduate of the University of Michigan. Broadway/National tour (keyboard and/or conductor) credits: Gotta Dance, If/Then, Porgy and Bess, Next to Normal, Spamalot, Avenue Q, Chicago, Mamma Mia! ; Disney’s On The Record. Off-Broadway: Avenue Q (music director), Newsical The Musical, Romantic Poetry (MTC) and Naked Boys Singing. Select others as music director: Shrek, Tarzan (Muny), The Last Five Years, Little Shop of Horrors (BTG) and The Midtown Men. Next up, Rick will be the associate conductor for Jerry Springer: The Opera at New Group. Rick is originally from the Chicagoland area and went to NYU.